Over the next twenty years, Ferndale is forecast to grow more rapidly than any community in Northwest Washington, adding nearly 7,000 people and up to 4,000 jobs. The Ferndale Market Area, which includes the City limits, the Ferndale School District, the Lummi Nation, and the Cherry Point Industrial Area, will provide new and varied economic growth, creating jobs and retail opportunities we can’t even imagine in 2016. To help chart our course through this period of rapid change, we have produced this 2016 Comprehensive Plan. This is not the first, nor will it be the last Comprehensive Plan for the City. The first was completed in 1968 and updated periodically through the 1980’s. 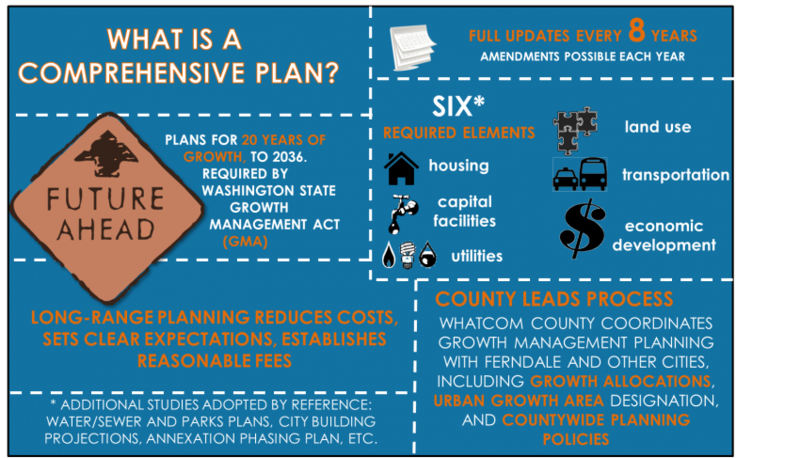 The Washington State Growth Management Act, or GMA, was adopted in the early 1990’s and requires that jurisdictions create plans such as this to ensure cities will continue to provide adequate services such as water, sewer, and roads; plan for system-wide transportation improvements like the Thornton Connector; and identify land uses and the land areas necessary to serve both new and existing development. The City’s first comprehensive plan under GMA was completed in 1997 and updated in 2005 and now 2016. Most cities create the document and then leave it on a dusty shelf. But here in Ferndale, we aim higher. Take a moment to watch this introduction video and then begin exploring the sections below. 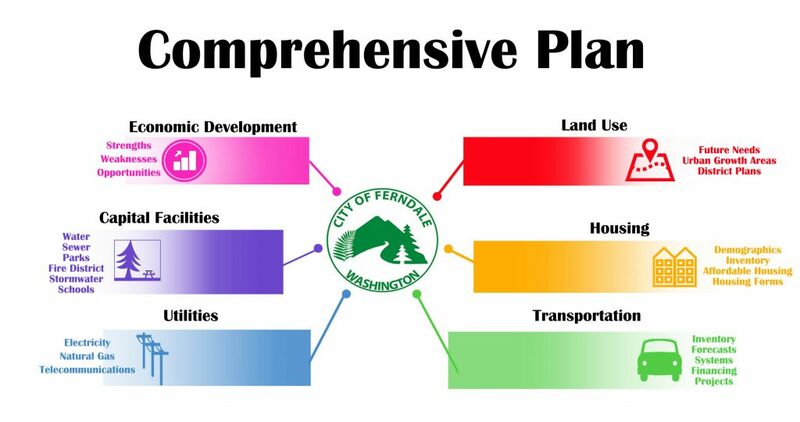 Each one has maps, materials, infographics and statistics to help you get a complete picture about how Ferndale is now and where we are headed in the next twenty years.